But over the past six months or so, I have felt the need for something much more moisturising around my eyes – they have often felt dry and tired and I haven’t really enjoyed so much the feeling of a “refreshing” gel or “cooling” roll-on. I’ve felt a distinct beauty yearning for a very rich formula with a nourishing feel, something to wear on days off when I’m not really that fussed about prepping for makeup. 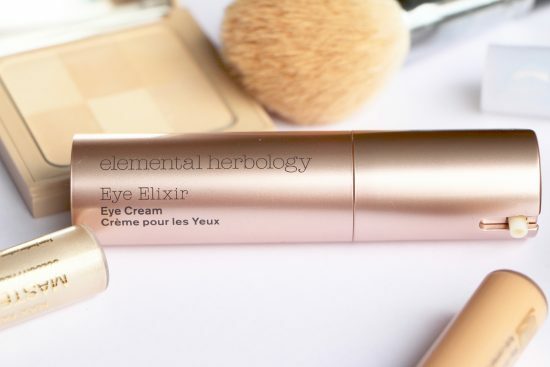 Though the Eye Elixir from Elemental Herbology does, in fact, sit perfectly well underneath makeup, it has a really gorgeous long-lasting moisturising effect that feels comforting and protective. I know that “residue” isn’t usually seen as a positive thing, but sometimes I feel as though I want that layer left over, almost like a protective barrier. And so I like the Eye Elixir because it feels so rich and nourishing, but actually the texture is quite lightweight and refreshing. There’s no heaviness to it at all – sometimes with a rich cream, you can feel as though the moisture is collecting in your eye bags! – it’s sort of energising, really, rather like one of those metal-ball-rollers, except without the extreme cooling effect. I feel as though you get the best of both worlds with this one – long-lasting, rich moisturisation but with a light, almost delicate feel. It’s not the cheapest eye cream out there, but neither is it anywhere near the price of some of the luxury creams I’ve tried that have disappeared after an hour, leaving my eye area as crepey and baggy-feeling as it was to start with.. The only thing I don’t like so much is that because it takes a little while to sink in – you get a bit of white residue on the skin – it’s not ideal if you’re really rushing to do your makeup. But I’ve addressed that already, I suppose, and I’ve said that I like the residue, so I can’t have things both ways. No other gripes whatsoever, I’ve ploughed through this and it’s not often I stick with an eye cream until the end. I like the fact that it’s packaged in a pump and I don’t have to take off the lid from a pot or tube – it’s a true one-handed product, just press down on the top and out comes the eye cream. I sort of wish all eye creams were packaged like this. Clean, convenient and easy to cart about, they’ve even managed to keep it quite streamlined and non-bulky – I have eye things in similar packaging that are over twice this size for the same 15ml! The blurb-bumf says that this elixir has a “botox-like effect” from its plant-based anti-aging ingredient and L-Ascorbic acid (vitamin C) to stimulate collagen production and protect against UVB and UVA damage. There’s also a gentle astringent to firm the skin, powerful peptides to help with eye bags, Hematite (?) and Kombuchka (??) to restore tone and radiance, Blue Green Algae to help smooth and re-densify the skin and Macadamia Nut Oil, Aloe Vera, Yerba Santa, Rose Water and Lavender Oil nourish, soften and soothe the delicate eye region. Bloody hell. It’s not shy on things it can do, is it? 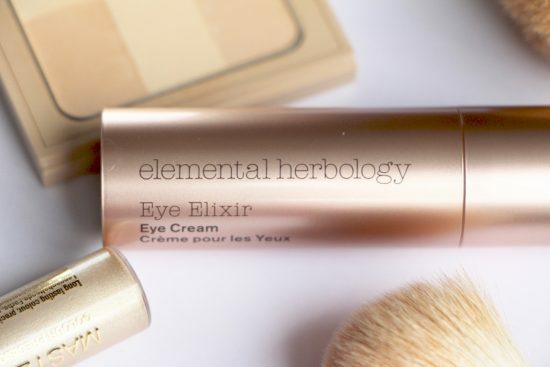 You can find the Elemental Herbology Eye Elixir at FeelUnique here, it’s £43. If you’re after a similarly rich-but-not-heavy eye moisturiser with a lighter price tag then take a look at my review of the Aveda Botanical Kinetics eye cream here. And for a lighter-lighter price tag, fear not: I’m on it. Testing in progress.